"Spring and the Love Bug"
One of my most favorite times of the year. 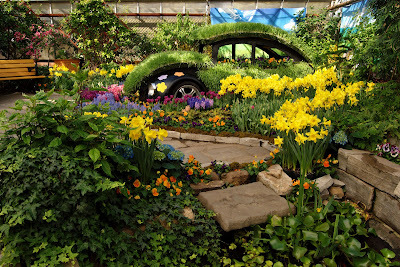 The annual spring bulb show at Hamilton's Gage Park. And this year they truly outdid themselves. Bold colors, hundreds of bulbs they grow on site in the new facility, and a groovy theme this year with some retro VW's, including one made out of grass and moss. I applaud all the hard working staff for such a vibrant and delightful show. I make two visits every year, and this image was from my initial visit yesterday. If you haven't been, what are you waiting for? A fantastic subject does not a fantastic photo make. If you make the mistake of thinking the nifty or pretty subject matter is going to do all the leg work, enabling you to just walk up and get the photograph "as is" then you have limited yourself to all the better possibilities within your camera's reach. It's easy to fall into the trap that a great visual instantly equals a great photograph. Take the time to see if there's something better. A better angle, time of day, better lens to use. Give it something that takes it from snap shot to photograph. Something to help it tell a story. I waited, I wandered away, I wandered back, and I made a realization that helped me get this particular view. I noticed no one took the time to stop on a little bridge over the pond, getting you up a little higher on the scene, and allowing the camera to include the layering of rock and flowers leading the eye up out of the pond in the corner and into the composition to end with the sweet little VW Bug. Not a Nobel Prize winning shot to be sure, but done with an approach that included observation, time, and thought. Have a great day gang! Thanks for the ramble!